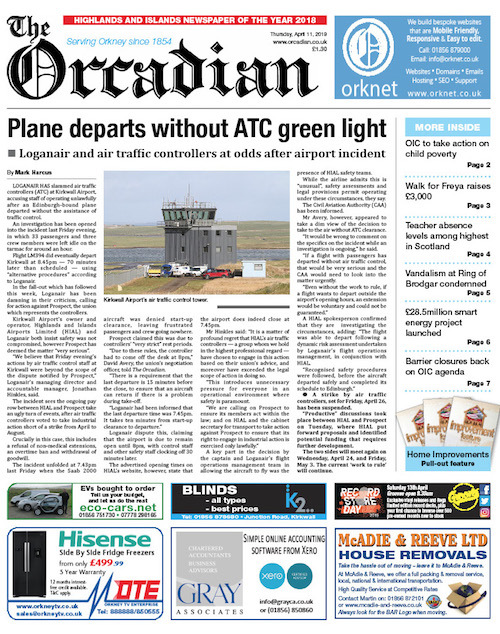 This week’s edition of The Orcadian is now available in shops and online, here. This week’s front page features an article on the furore surrounding an incident which saw a plane depart Kirkwall Airport without clearance from air traffic controllers, who are in the middle of industrial action as part of a dispute over pay. • What’s next for Stromness? For all these stories, plus our round-ups of all the week’s politics, sport and news, pick up a copy of The Orcadian today.